The colors in this bedding are fantastic. The print is just right mix of geometric and boho chic. 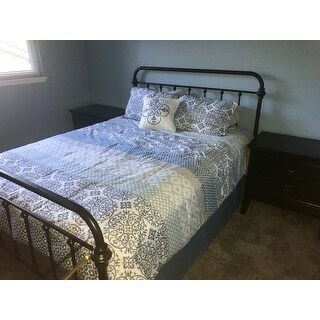 It looks great in the new bedroom and mixes well with other prints because it has so many shades of blue and grey! Bring a refreshing splash of color to your bedroom with the Madison Park Essentials Sybil Complete Bed and Cotton Sheet Set. This beautiful comforter features a globally inspired printed motif in subtle, gorgeous hues. The coordinating sham(s) complement the pattern seen on top of the comforter to pull the look together. Harmonizing with the comforter, a 100-percent cotton sheet set provides an alluring touch with its printed design and soft tones. Lovely comforter set. Colors are true to online pictures. However, comforter and sheet fabric seemed to be lacking in quality. Loved it: Beautiful color, nice fabric - perfect for my new room but doesnt cover my 14" Full Guestroom mattress. Have to return for a larger quilt. If it didnt come with sheet set, I'd order the queen or king! Redid a bedroom for my son who is away at college and wanted blue linen and if it had gray in it that’d be a plus. This is perfect. It’s soft and really pretty. I’d buy it again. Beautiful design, great quality, and excellent price! Love it! Returned....does not fit a California King. Quietly blue, and right for someone for sure. It was just a little paler than I needed.